There is no better place to be than the breakfast table on the weekend. Pancakes are certainly a great make-ahead to heat up in the morning for a quick breakfast during the week but my favorite thing is a leisurely breakfast at home on the weekend. We had some great family breakfasts this past Labor Day weekend, starting with these awesome pancakes! I love getting into the kitchen and cooking weekend breakfast for my family. Pancakes (and bacon) happen often since they're my son's favorite. I was a little nervous about what he'd think of these pancakes - because of the oats - but it was definitely worth the trip to the supermarket to get the quick-cooking kind; I now know they work perfectly in pancakes. After whisking the dry ingredients together (I might substitute some of the all-purpose with white whole wheat flour next time), make a well and add the wet ingredients. Aside from buttermilk and 2 tablespoons of Nutella, there's an egg hidden in there! When I first looked at the recipe, I thought the butter was missing...then I realized the Nutella was taking their place. That's a great substitute in my book! I started whisking in the center, working the Nutella into the buttermilk and egg, then finished by bringing the wet and dry ingredients together. I do like looking at the process pictures and seeing how the food comes together. Looks a bit like chocolate oatmeal when it's first combined. Then, start ladling the batter and flipping those pancakes. 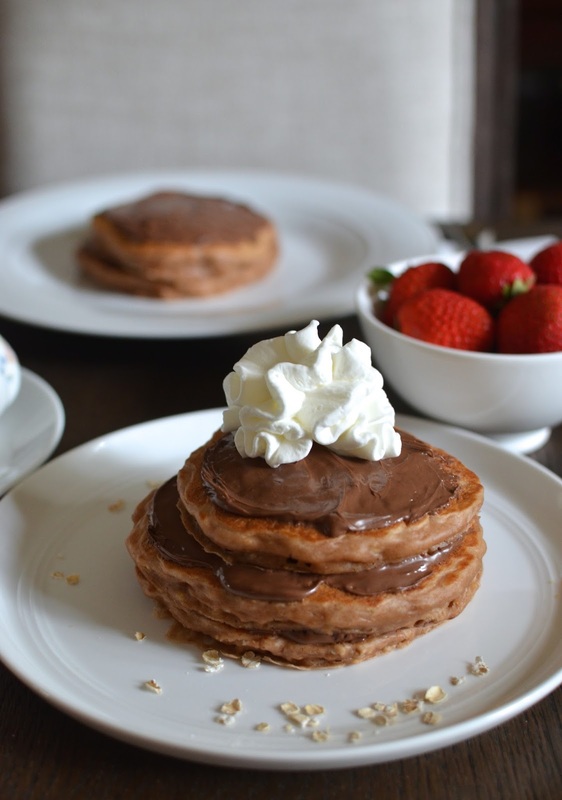 Before you know it, you're filling a plate with these wonderful Nutella oat pancakes, ready for the breakfast table. The weekend breakfast table is another one of my happy places. And it's even more fun when my family and I are trying something new and we talk about what we think as we eat (what's more fun than a taste-test!). They're always curious (and sometimes a little dubious at first in the case of my little guy) and it's fun to see how things go over. These pancakes went over quite well; I enjoyed them very much and will be happy to flip these any morning for breakfast...though I'm not opposed to pancakes for dinner, either! In a large bowl, whisk together the flour, oats, baking powder, baking soda, and salt. Make a well in the center of the bowl. Add the buttermilk, egg, and Nutella into the well. Whisk, starting in the center, then working your way to combine the ingredients together. Heat and lightly grease a griddle or non-stick pan over medium-high heat. Spoon batter onto the griddle (I used about 1/3 cup or so for each but follow your own preference). Cook for about 2-3 minutes, or until bubbles begin to form around the edges of the pancakes. Flip, and cook for another minute or so, until the other side is golden. Plate, and continue to remaining batter. Serve with a little extra Nutella spread on top of each pancakes, if desired. This sounds so easy and looks absolutely wonderful! I was thinking about pancakes last night. I am putting Nutella on the grocery list. And maybe a can of whipped too! Hope you have a lovely weekend Monica! They look so fluffy and wonderfully delicious with nutella! Yes, buttermilk pancakes are so great and those 2 tablespoons of Nutella give them such a nice twist. I wouldn't have thought to add it to the batter but it sure works. Tastes like an oatmeal cookie??? Sign me up! Want to come make me a batch this weekend?? ;) haha I wish! I hope you have a wonderful weekend Monica!! I kind of want them again so I'm happy I have plenty of quick cooking oats in the pantry now. Good luck with settling in! Hopefully, you'll have time to leisurely flip pancakes again soon! Nutella pancakes sound like the BEST thing ever. And the oats tooootally make them health food, right? Oh my goodness, I love the oats in here! Oatmeal cookies are my favorite and in pancake form with Nutella?! They look SO delicious, Monica and such a special treat! Weekend breakfasts are my favorite and I can definitely see why your fellas loved them :) Have a wonderful and relaxing weekend! Pancakes that tastes like oatmeal cookies would be dreamy... Loving your nutella topping and whipped topping. I am sure this made your 11 year old smile. Gotta have just a little extra Nutella with the Nutella, right! ; ) My fellas are happy to try all new pancake varieties and these are easy to like! ANYTHING with Nutella is something I will make over and over. These pancakes look amazing! I love pancakes and this one looks so delicious and interesting. Can't wait to try this out. WOW! I'm so glad I tried it...the oats nearly soften all the way so it's not a big impact. If you like Nutella, it's a safe bet. Yes please! Oat pancakes sound like a great twist on 'ordinary' ones, would love this for breakfast. Thanks, Caroline. I had the same feeling. Anything with Nutella is a win for me. Oat is such a fun and healthy addition. Love these pancakes with oats are so healthy and so delicious. I can see myself digging into these for breakfast tomorrow. Yum!!! Oh Monica, what a treat for breakfast...I love the idea of nutella every where...and it sound easy...great recipe and thank you so much for sharing it. My daughter grew up on nutella, Monica. Its the best thing to have on hand. I love your smart idea of adding oats. Your nutella-loving daughter just might enjoy this, Balvinder! And it was certainly smart of Erika to incorporate the oats; I can't take any credit except that I was "smart" enough to try her recipe. I'd never eaten pancakes with oats til now. I'm a fan!